Broward Center for the Performing Arts' Au Rene Theater. For decades now, Florida Grand Opera has packed up its lavish sets and costumes and trooped up from its home base in Miami to the Broward Center for the Performing Arts for at least two shows per season. But support for the opera in Broward has significantly declined in recent years, both in terms of ticket sales and donations. Florida Grand Opera General Director and CEO Susan Danis says one reason is that many of the wealthy donors the company has relied on in the past have died. “They were folks who really believed in FGO and were substantial contributors," says Danis. "And unfortunately, we have not been able to identify folks who have that same sort of capacity to support us." 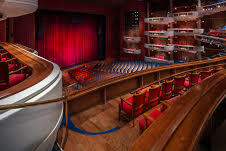 Danis says that unless Florida Grand Opera can raise $400,000 from Broward patrons and donors by Jan. 31, there will be no performances at the Broward Center during the upcoming season. In the meantime, the company is looking at other ways of delivering the goods to Broward opera fans. They include arranging for free bus service from Fort Lauderdale to Florida Grand Opera’s home at Miami’s Adrienne Arsht Center.